Is the Hebrew Alphabet (Aleph-Bet) a purely man-made arbitary creation or does it reflect (or embody) universal and transcendental qualities? I will confess straight away that I personally believe that the Hebrew Alphabet does have transcendentant properties and is very likely integral to the Universal Language that I am researching. However I believe that today, even in the most erudite and secret of societies true knowledge of it has been largely lost, surviving only in fragments, often misunderstood and ovelaid with personal and culteral bias. In my view, when exploring phenomena such as the Hebrew Alphabet and investigating it's universiality, we should consider other phenomena that shares it's known properties. The best example in this case is other phenomena connected with the number 22. According to the Kabbalists the 22 letters are divided into 3 groups: the 3 Mother Letters, the 7 Double letters and the 12 Simple Letters. Do any of the other 22 related phenomena also divide naturally into this 3:7:12 pattern? If so then we have a stronger possible link between the Hebrew Alphabet and the other phenomena. In other words the fact that 2 sets of phenomena share not only the same overall number but also an inner pattern strengthens the case that they are linked. To make it clear, what we are looking for is a direct 1 to 1 correspondence between each 1 of the 22 in the 2 sets. There is a relatively quite well known connection between the 22 letters and "The Cube of Space" (there is a lot more on the Cube of Space in my Esoteric Section). The 3 dimensions of space correspond with the 3 Mother Letters. 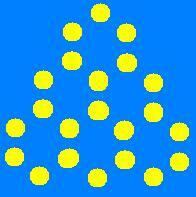 The 1 center and 6 faces (ie the 7 Directions of Space) correspond with the 7 double letters. The 12 Edges (ie the 12 Subdirections of Space) correspond with the 12 Simple Letters. What do I mean by based on their scheme? Well the 3 mother letters are seen as a set. Therefore they are placed equally apart in a triangle. It is understood that Aleph is neutral so it is placed "centrally" between the other 2 Mother Letters. The other letters are placed in accordance with their supposed make up from the Three. For example in their scheme Gemel=Aleph+Mem. 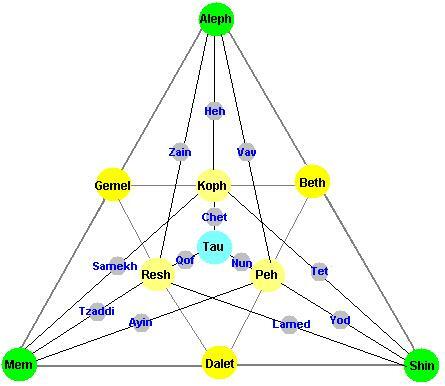 Therefore I placed Gemel directly in between Aleph and Mem. If Shin is seen as yang polarity, Mem is seen as yin polarity and Aleph is seen as neutral/tao then this diagram reflects the aproximate polarities of the other letters. The central letters are balanced , those on the left are yin and those on the right are yang. 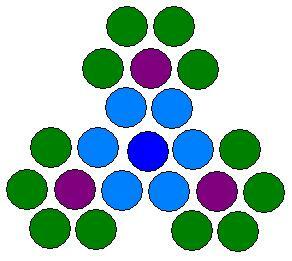 Compare the diagram I formed from Bill Heidrick's scheme with the diagram formed with the 22 circles. I have highlighted the 3, 7 and 12 the same in each diagram to highlight the correspondence. Why do I say it is significant? The pattern allows for a 3:7:12 organization of the 22. The pattern is symmetrical and beautiful. The inner 10 circles form the Tetraktis pattern. There is also another, at first seemingly unrelated, area of mathematics that adds strength to the proposed correlations. 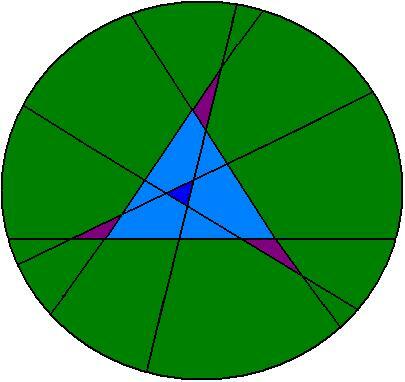 Circle Division by Lines is the maximum number of ways there are of disecting a plane with n number of straight lines. As you may know Pi is a transcendental number, and yet exactly 6 equally sized circles fit exactly around a circle of the same size. This whole number relationship with Pi highlights the number 6. The above diagram is not "idealized" in that the exact proportions for the spaces are probably not correct. With work, they may be worked out and reveal other universal secrets. As you can see the set of 19 Tetrominoes display the required properties. There certainly seems to be a one to one connection between the 19 Tetrominoes and the 19 Tao Imbued Permutations of Yin, Yang and Tao over 3 places. But what about the 3 Mother Letters? 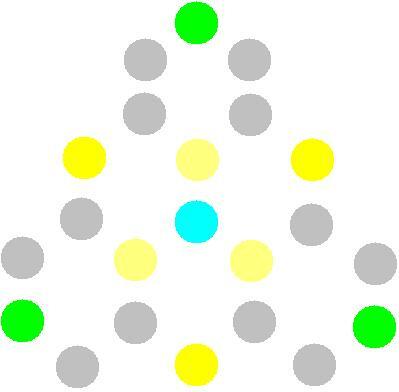 Could they be represented by simpler Polyminoes?